Autoelectro, based in Bradford, has won a Green Apple Environment Award in the international campaign to find the greenest companies, councils and communities. The Company competed against more than 500 other nominations in the Green Apple Awards for Environmental Best Practice, and received their trophy and certificate at a glittering presentation ceremony in the Houses of Parliament, London on Monday, 16th November. The Speaker at the ceremony was Mr Michael Cooke, ex MP for the Environment and was hosted by the MP for Ashford, Mr Damian Green. The awards were presented by Ms Aleah Leigh who is building a reputation as an environmentally conscious fashion designer, highlighted by her dress which was made from used train tickets. As a result of this Green Apple Award success, Autoelectro has been invited to have its winning paper published in The Green Book, the leading international work of reference on environmental best practice, so that others around the world can follow their example and learn from them. The awards are organised by The Green Organisation, an independent, non-political, non-activist, non-profit environment group dedicated to recognising, rewarding and promoting environmental best practice around the world. The Green Apple Awards are supported by the Environment Agency, the Chartered Institute of Environmental Health, the Chartered Institution for Wastes Management and other independent bodies. Managing Director, Tony Bhogal, commented that the award was an apt acknowledgement for its efforts and continual investment in the environment with regard to its products and manufacturing processes. The company is ISO14001 accredited which is the internationally recognised Environmental Management Standard. He added that the award recognised the company’s commitment to the environment with its principal activity being the remanufacture of starter motors and alternators for the automotive industry particularly in the face of pricing pressure from cheaper quality far eastern copy parts. The remanufacturing process involves the complete dis-assembly of the old Starter Motor and Alternator, replacement of faulty and wear parts, re-assembly to an ‘as-new’ standard and final testing to Original Equipment specifications using the latest state-of-the-art computerised test-benches. Every remanufactured unit is virtually indistinguishable from new and is sold with a two years warranty. Autoelectro supplies its products throughout the UK and Ireland and is looking to expand further into Europe. The company has been established since 1986 and is privately owned. 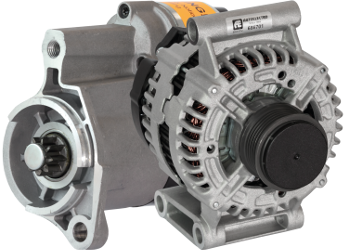 It is also ISO9001 and OHSAS18001 accredited and is the largest UK based remanufacturer and supplier of automotive Starter Motors and Alternators in the country.